Teenage Korean-American ice dancer Min Yu-ra and her partner Timothy Koleto were the only team competing in the 2013 Korea Skating Union's President Cup Ranking Competition at the Mokdong Ice Rink last weekend. 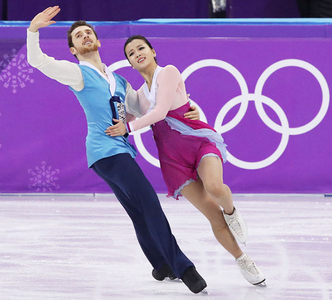 The team earned 36.39 points in the short dance on Saturday, and 69.49 points in the free dance on Sunday. They finished their official Korean debut with a total score of 105.78 points. "The score wasn't as high as I had expected, but loud cheers from the audience boosted my energy," Min said. Min's parents moved to California in 1989, where she was born in 1995. She started figure skating at the age of six, and loved it so much that she spent almost all day on the ice. However, she did not have a breakthrough as a single skater. Koleto (22) used to be a promising singles skater at a junior level, finishing sixth in the 2012 U.S. Championships. However, frequent injuries prevented him from mastering jumps at the senior level and made him rethink his future. Min and Koleto had known each other from junior competitions, and when Min proposed to form an ice dance team, Koleto agreed. They have been training together since April this year. Their goal is to represent Korea at the 2018 Winter Olympics in Pyeongchang, but in order to do so they need Korean nationality. Unlike the Olympics, the International Skating Union has more lenient rules and only one of the two skaters needs to hold the nationality of the country they wish to represent. Min, who holds dual Korean and U.S. citizenship, said, "We are still thinking about whether he will naturalize or not. We'll discuss this as we train." She added, "Our initial goal is to compete at the 2015 Four Continents Championships in Seoul. I want to be in an ice show with Kim Yu-na, too." In the ladies' singles, Park So-youn and Kim Hae-jin took the top two spots to earn two remaining spots in the Olympics along with the defending Olympic champion Kim Yu-na.